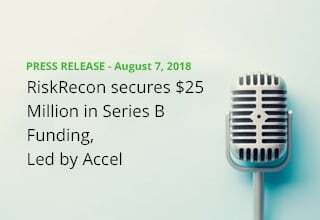 Salt Lake City, Utah (August 7, 2018) – RiskRecon, the fastest-growing company transforming management of third-party cyber risk, today announced it has raised $25 million in Series B financing. Led by Accel and joined by existing investors Dell Technologies Capital, General Catalyst, and F-Prime Capital, the global venture capital firm affiliated with Fidelity Investments, the round brings RiskRecon’s total funding to more than $40 million. Existing individual investors Mickey Boodaei, Rakesh Loonkar, and Paul Sagan also participated in the round. In conjunction with the investment, Accel partner Nate Niparko will join the company’s Board of Directors. RiskRecon will use the capital to meet increasing global market demand for third-party cyber risk management solutions. RiskRecon’s customer base has nearly tripled in the last twelve months, as companies realize the benefits of the only continuous monitoring solution that delivers risk-prioritized action plans enabling precise, efficient elimination of their most critical third-party security gaps. RiskRecon is headquartered in Salt Lake City, UT and is actively looking to expand its rapidly growing team of security professionals. RiskRecon’s continuous monitoring solution delivers risk-prioritized action plans that enable precise, efficient elimination of companies’ most critical third-party security gaps. Its data-driven SaaS service relies on passive, direct analysis of Internet-facing systems to quantify risks and provide straightforward evidence necessary for remediation. Rather than producing a laundry list of issues, RiskRecon’s custom analytics quantify true risk by determining each system’s issue severity and asset value. Only RiskRecon enables customers to build a scalable, third-party risk reduction program that compresses remediation cycle time, improves analyst productivity, and ensures constructive vendor collaboration. Learn more at www.riskrecon.com.